Apple Cider Vinegar, combined with other natural herbs, helps your body turn fat into muscle by stimulating your fat cells and helping you burn extra calories. Modelslim provides a safe, natural and proven solution for reducing weight and increasing energy. 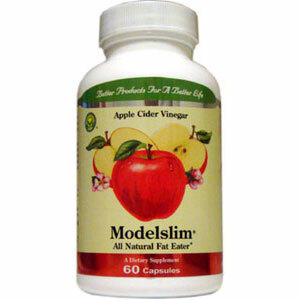 The main ingredient in Modelslim is Apple Cider Vinegar – the most natural fat eater available. Apple Cider Vinegar, combined with other natural herbs, helps your body turn fat into muscle by stimulating your fat cells and helping you burn extra calories. Other ingredients: Microcrystalline cellulose, Silica, Talcum, Magnesium Stearate and gelatin. Reduce fat, helps turn fat into muscle, helps burn extra calories, reducing unnecessary body weight. Take 2 capsules 3 times a day with food. For those with a history of a sensitive stomach, take 1 capsule 3 times a day with food for the first week, then increase to 2 capsules 3 times a day with food. If you are pregnant, nursing or taking medication, consult your doctor before use. Discontinue use of this product and consult your doctor if any adverse reaction occurs. Keep out of reach of children.